In my strong opinion, a subwoofer should be audible and authoritative down to 20 hertz, and have a relatively flat frequency response while doing it. Not just make noise, but be heard clearly and powerfully. Simple enough, right? Even a lot of high end professional ported subs used at theaters and concerts are only rated for 40 hertz, so what are you missing? The “WOW” feeling we all hope for. You won’t know it until you’ve heard it. The visceral feeling I get at home is more substantial than most movie theaters. That’s an insane statement, and it’s a LOT of fun! Theaters may have more loudness, but for the home you can have more controlled deep bass with fewer bleeding eardrums, while still being able to go louder than I am personally comfortable with. I prefer sound quality over maximum volume. Some Imax theaters produce comfortably down to 23 hertz according to the video below. The most economical subwoofer I recommend is measurably comfortable at around 21 hertz, and clearly audible at 19 hertz. Amazing for a 10 inch driver, and absolutely uncommon. It’s important to understand that frequency response numbers are commonly misleading, and a sub accurately rated for 19 hertz can trample all over a sub “factory rated” for 16 hertz. Confused? I was too, and seriously frustrated! I’ll try to simplify as much as I can. I’ll try give you the basics, show you some specific examples of quality subwoofers, and you can take it from there. My goal is to help save my audience some time, money, and frustration. I don’t mean to make anyone feel bad about their current subwoofer, just bring your attention to what is available for when you do decide to upgrade. Spending good money on audio and getting that unsatisfied feeling is no fun. There are a lot of good brands out there, but the really great subwoofers are known to very few, or they are crazy expensive. I don’t focus on the crazy expensive, I’m more value conscious. Have a look around, the subwoofer is not as simple as some might believe, and just because a brand is well known does not mean everything they offer is top notch. There are a handful of brands that produce excellence, and they will be discussed quite a bit. Hi. I’ve got dual Polk psw 404. Would I hear a huge difference down to 20 hz with dual pb1000s?. And what about spl. My room is 1320ft3. Absolutely. The depth and power would be undeniable. Thanks. I ordered a pair.. Honestly, I think an SVS PB-1000 would be the better sub. It would go deeper than those subs, giving a better overall experience. Both of those brands are respectable and make good products, but like most other brands out there, the SVS subs just goes deeper. I wish I could point you towards something I could recommend, but honestly I’d just be guessing. Most subs are just too shallow, so I don’t focus on them, nor do I recommend them. I’m sorry if that’s frustrating, but I don’t want to suggest something if I’m just going to be guessing. If I wouldn’t buy a sub myself, I wouldn’t suggest someone else buy it either. Sadly, proper bass is not cheap, but once you hear it going backwards is really hard. As far as room size, I packed dual PB-16 Ultras into a 11×11 foot room, and aside from looking silly, the sound was better than I expected. Room size is mainly a limitation as you go up in size. In smaller rooms it’s about what you can physically fit. So long as you run duals you can run monsters if you want. You’ll have challenges in a smaller room regardless, but having a lower powered sub won’t necessarily sound better than a high powered one. So, your suggestion is to buy svs brand subwoofer right?. Very hard to go wrong with a ported SVS subwoofer. Sorry I missed this comment! Thanks, I ordered a few of those. Would you ever do a review between the pb2000 and hsu vtf2-mk5 sense these 2 subs are close on specs. I’ve read several posts from various sources about port chuffing. Some of these posts unfortunately mentioned the SVS PB1000 as being one such offender. I just ordered 2 PB1000’s(can’t wait for them to arrive), but now I’m worried this may be an issue I’ll have to deal with. These will be replacing 2 Polk Audio PSW110’s(which have an extension of only about 32 to 30 hz), so I’m hopeful they’ll add a new and exciting dynamic to my listening(70% music, 30% movies). Do you have any thoughts or advice on this particular phenomenon? I usually don’t turn my system volume above -18 or -15(Typically no higher than -21), but these posts I read have folks saying “I get port chuffing even at low volume”. So I guess I’m excited and concerned at the same time. There are a few intense scenes that will cause port noise on most ported subs out there. These scenes are few and far between, and 99.5% of the time it will not be an issue. The opening credits of Edge of Tomorrow is a well know torture test, it’s what I used to blow out the candles on my channel with the PB-16 Ultras. Even those can have port noise in extended mode (1 port plugged), but in standard mode (all ports open) there is no port noise that I could detect. The PB-4000’s have been free of port noise in any configuration, but I still prefer the PB-16 Ultras, they don’t really need extended mode, and they have an outstanding presentation. Money no option, they are the best subs I’ve heard so far. They can massage your spleen, while still remaining super comfortable to your ears during those massive scenes. In other words, complete enjoyment, quite a trick. Granted, they are capable of hurting you, but so are the PB-1000’s, due to some errors on my part when I was learning to measure subs, my ears were ringing for a couple weeks. I suspect overall you will be pleased with the PB-1000’s, especially considering the subs you’re coming from. I suspect the only time you’ll get much port noise is when you go looking for it. Let me know how it goes! I agree with Ryan. The subwoofer are a huge difference. They go low and everything sounds excellent with added depth. Ive had the polks psw404 subs and they lrolled of at 32hz. I pjt them side by side to see what differences I would hear and boyyyy was it night and day. The svs played notes I couldnt hear or didnt even know was there both in busic and movies and it literally blends in seamlessly. I can’t even listen to the movies at max volume because these things sound massive. U won’t be disappointed. This is coming from a basshead that loves low frequency bass. I just wish I could afford the pb 2000s. I received my PB1000s almost two weeks ago and I’ve been quite impressed. Granted, they’ve yet to fully break in, but even so they’re light years beyond the Polk PSW110’s. I gave my Polks to a good friend who I’m sure will like them(being free and all), but I just enjoy the experience I’m having now so much more. I’ve adjusted them to be +3db above the fronts and I’d say that’s the sweet spot for me. It seems that sounds from my other speakers are much clearer now due to not having a boomy mid-bass hump, yet the extension is amazing. Music sounds “real” and explosions in movies have less boom and more BLAST. I’m very happy with these, and I sure appreciate your recommendations on these. Right on, I wouldn’t have recommended the PB-1000’s if they didn’t have the chops. They are a gateway drug, just FYI. Bass energy, when balanced, is exciting, fun, and more addictive than you might expect! Here are few fun movies to check out: The Accountant, Hacksaw Ridge, Apollo 13, Roger Waters The Wall, and The Eagles Farewell 1. There are others of course, but those are a few of my favorites, and good subs absolutely make a difference with those movies. Also, check out my Hack Series, especially “Unlocking Your Blu Ray”, as the default setting can prevent the best audio formats. Makes a big difference if you haven’t already done it. Like a secret handshake you have to know to get the good stuff. Eagles also requires you to press the audio button to get DTS Master, and the difference is well worth it!! Best live concert I’ve heard so far. “The Gain Hack” does well with the PB-1000’s as well. 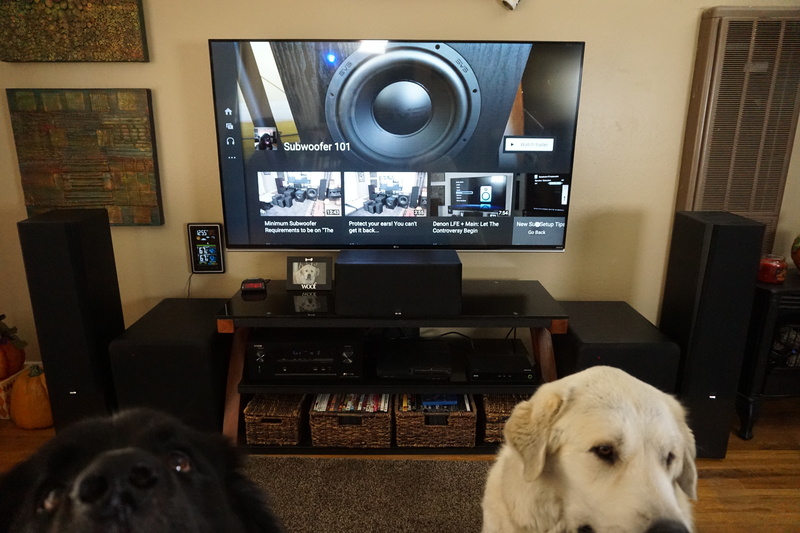 Stoked you’re enjoying quality bass, it really wakes up a home theater! Once you hear it in person, there’s really no other way to go. Thanks for the support! They are on The List, so I’d be happy to review them given the opportunity.